88% of patients in the phase 3 clinical studies were maintained at the 150 mg BID dose. *If further dose reduction below 100 mg/day is required, discontinue TAVALISSE. †Once-daily TAVALISSE should be taken in the morning. TAVALISSE is indicated for the treatment of thrombocytopenia in adult patients with chronic immune thrombocytopenia (ITP) who have had an insufficient response to a previous treatment. Hypertension can occur with TAVALISSE treatment. Patients with pre-existing hypertension may be more susceptible to the hypertensive effects. Monitor blood pressure every 2 weeks until stable, then monthly, and adjust or initiate antihypertensive therapy for blood pressure control maintenance during therapy. If increased blood pressure persists, TAVALISSE interruption, reduction, or discontinuation may be required. Elevated liver function tests (LFTs), mainly ALT and AST, can occur with TAVALISSE. Monitor LFTs monthly during treatment. If ALT or AST increase to >3 x upper limit of normal, manage hepatotoxicity using TAVALISSE interruption, reduction, or discontinuation. Diarrhea occurred in 31% of patients and severe diarrhea occurred in 1% of patients treated with TAVALISSE. Monitor patients for the development of diarrhea and manage using supportive care measures early after the onset of symptoms. If diarrhea becomes severe (≥Grade 3), interrupt, reduce dose or discontinue TAVALISSE. Neutropenia occurred in 6% of patients treated with TAVALISSE; febrile neutropenia occurred in 1% of patients. Monitor the ANC monthly and for infection during treatment. 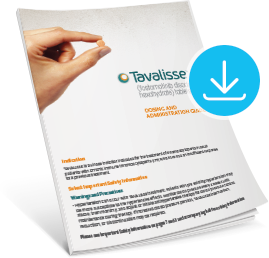 Manage toxicity with TAVALISSE interruption, reduction, or discontinuation. TAVALISSE can cause fetal harm when administered to pregnant women. Advise pregnant women the potential risk to a fetus. Advise females of reproductive potential to use effective contraception during treatment and for at least 1 month after the last dose. Verify pregnancy status prior to initiating TAVALISSE. It is unknown if TAVALISSE or its metabolite is present in human milk. Because of the potential for serious adverse reactions in a breastfed child, advise a lactating woman not to breastfeed during TAVALISSE treatment and for at least 1 month after the last dose. 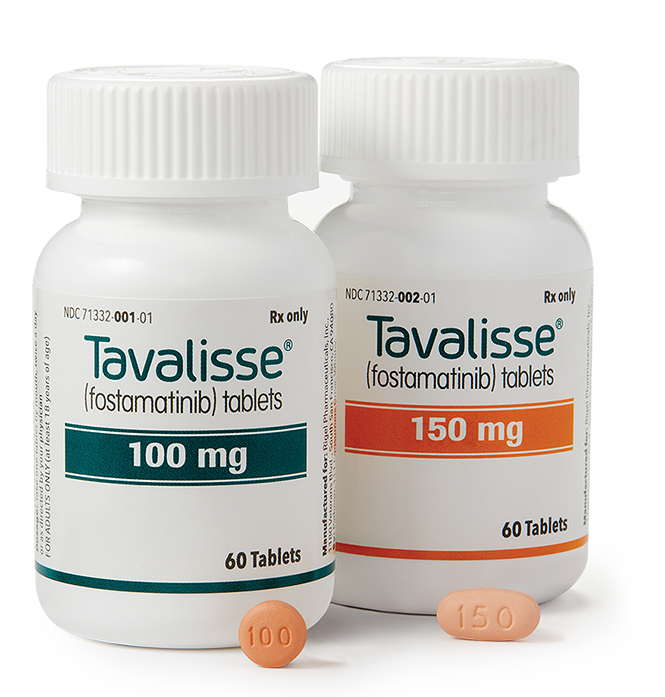 Concomitant use of TAVALISSE with strong CYP3A4 inhibitors increases exposure to the major active metabolite of TAVALISSE (R406), which may increase the risk of adverse reactions. Monitor for toxicities that may require a reduction in TAVALISSE dose. It is not recommended to use TAVALISSE with strong CYP3A4 inducers, as concomitant use reduces exposure to R406. Concomitant use of TAVALISSE may increase concentrations of some CYP3A4 substrate drugs and may require a dose reduction of the CYP3A4 substrate drug. Concomitant use of TAVALISSE may increase concentrations of BCRP substrate drugs (eg, rosuvastatin) and P-Glycoprotein (P-gp) substrate drugs (eg, digoxin), which may require a dose reduction of the BCRP and P-gp substrate drug. Serious adverse drug reactions in the ITP double-blind studies were febrile neutropenia, diarrhea, pneumonia, and hypertensive crisis, which occurred in 1% of TAVALISSE patients. In addition, severe adverse reactions occurred including dyspnea and hypertension (both 2%), neutropenia, arthralgia, chest pain, diarrhea, dizziness, nephrolithiasis, pain in extremity, toothache, syncope, and hypoxia (all 1%). Common adverse reactions (≥5% and more common than placebo) from FIT-1 and FIT-2 included: diarrhea, hypertension, nausea, dizziness, ALT and AST increased, respiratory infection, rash, abdominal pain, fatigue, chest pain, and neutropenia. To report side effects of prescription drugs to the FDA, visit www.fda.gov/medwatch or call 1-800-FDA-1088 (1-800-332-1088). TAVALISSE and RIGEL ONECARE are trademarks of Rigel Pharmaceuticals, Inc.
RIGEL ONECARE is a patient support center sponsored by Rigel Pharmaceuticals, Inc.